Stout was long overdue for a visit by TheBurgerBusters, and we finally managed to right that wrong. Fat Bruce Lee (actually on a diet), myself, and The Marinater met up for lunch. Parking was a massive hassle, and we ended up shelling out 6 bucks to valet the car in the lot directly in front of the restaurant. Stout had a burger-heavy menu, but the staff was light on burger knowledge, and that did not bode well. Stout had only pre-set burger selections, but they did allow us to order the burgers minus the toppings that we wished to skip. I ordered The Imperialist, which was the closest thing to a plain cheeseburger that I could find. I asked them to put the mustard relish, ketchup, and roasted tomatoes on the side. I ordered my burger Medium. after about a ten-minute wait, Fat Bruce Lee's burger was perfect, but the other two burgers arrived cooked to Well Done. At Stout, re-fires went to the back of the line. A ruined order led to a ruined dining experience. Fat Bruce Lee finished his meal well before the second attempt at the other two burgers arrived at our table. Meanwhile, numerous other tables that were seated after ours received their orders. This was sloppy and inconsiderate of the restaurant. On the second attempt, the burgers came out a lukewarm and mushy Rare, but we simply did not have the additional time to let the kitchen try yet again to cook a competent burger. Our server didn't seem to care that the burgers were a flop and that we pushed them away after trying half. The Beef: The beef at Stout was a very greasy blend of Brisket and Chuck (huh?) from Newport Meats. I guessed that the fat content was close to 30% based on the oiliness of the bite and the stomach pangs that followed the meal. The under-cooked beef was bland, watery tasting, and mushy. The burger had no trace of aging or minerals. The claim was this was a 7-ounce patty, but that was probably overstated...the burger patty at Stout felt like it was 6 ounces at best. 6 ounces, 7 ounces--who cares--it was miserably bland and terribly greasy. The Seasoning: There was none. The bland beef was completely unseasoned. 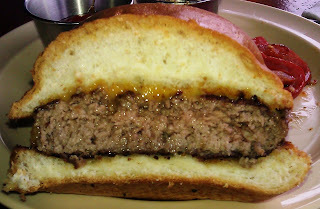 The Sear: The sear on the burgers at Stout was oddly impressive. Naturally, the sear on the over-cooked first attempt was superior than what we saw on the under-cooked version. Still, in both cases, the kitchen applied a solid sear to the patties. This was for naught, however. The sear only provided texture enhancement. The bland flavor was not improved. The Preparation: It was a mystery to me why Stout chose to serve a burger comprised solely of two of the blandest cuts of beef. The beef was ground in-house, and it was formed into loose patties during morning prep. The burgers were cooked on an appropriately hot flat-top. Sadly, the kitchen staff appeared to be picking the moment to stop cooking the burgers by using some sort of random number generator. Out of five burgers that made it to our table, only one was properly cooked. The lack of seasoning was also an issue. They seasoned the fries, so I was able to deduce that they weren't out of salt. The Cheese: Stout offered a number of cheese choices. The Imperialist came with Aged Cheddar. The Cheddar was completely useless. It tasted of absolutely nothing. It was only barely melted over my nearly raw burger, and it was punishingly bland. The Bun: The bun at Stout managed to be the star of the show. That was because the bun had actual flavor. The source was a mystery to the staff, so I can't properly acknowledge the purveyor. That said, the brioche was soft, fresh, moist, sweet, and tender. It was also the only thing that we could taste when eating our burgers. This phenomenon was also noted by the minions back at the world headquarters after we brought the uneaten portions of our burgers back for second and third opinions. The Meat To Bun Ratio: This was fine in terms of texture. The Toppings: The roasted tomato slices were lukewarm and unappealing. Fat Bruce Lee had his burger without a bun. Instead it was served on a bed of leathery arugula. He described this as trying to eat a tree. 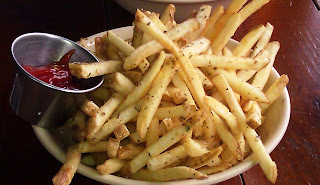 The Fries: The fries at Stout were terrific. We tried both the sweet potato and standard fries. Both were cut in-house, and the standard fries were peel-on. The fries were nicely seasoned and properly crisped. The Value: It was 10 bucks for a tasteless, incompetently prepared, and small burger. It was 4 bucks for decent fries at Stout. The value was exceedingly weak. When we tried Stout, it was during the lunch hour on a Friday, and it was less than 50% full. That should have been an indication of what to expect. 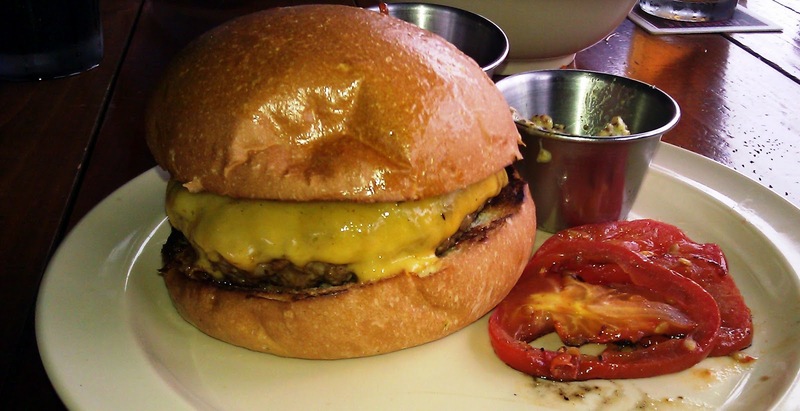 Burger Review : A bland, greasy, over-priced, badly prepared burger was not enjoyed at Stout.